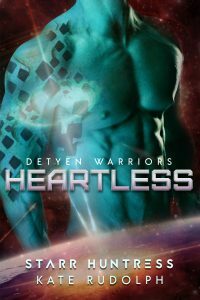 After witnessing the impossible mating of his fellow soulless warrior, Kayde doesn’t expect a denya of his own. But whenever Quinn Porter walks into a room, he can’t keep himself from watching her, from following her, from wanting her. And those desires mean trouble for a man who isn’t supposed to feel anything. Sure, she was captured by pirates and abused for months, but Quinn’s doing her best to stay positive and create a good life back on Earth than. She has a small group of friends made up of fellow survivors and the determination to recover from all that was done to her. She’s not in the market for a man, but a certain coldly loyal Detyen could make her change her mind. When Kayde undertakes a mission to journey back to his Detyen home, he’s ready for the solitude. What he doesn’t expect is Quinn hiding away in one of the bunks on his ship. Forced to undertake a dangerous mission together, even knowing that the remnants of emotion he feels when she’s around might be signs of oncoming madness, Kayde and Quinn will need to rely on each other when everything goes wrong and their lives and freedom are at stake. Can a heartless warrior recover his soul in the arms of a broken woman? Or will the wounds of their pasts prevent the hope of a future? Each Detyen Warriors novel can be read as a standalone. Enjoy feisty women, alpha aliens, fated mates, and relationships hot enough to steam up your screen. Kate Rudolph is a participant in the Amazon Services LLC Associates Program, an affiliate advertising program designed to provide a means for sites to earn advertising fees by advertising and linking to Amazon.com. The site also participates in the iTunes affiliate program and the Rakuten Walmart books affiliate program at itunes.apple.com and kobo.com.